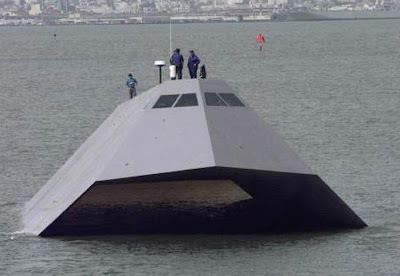 Psst... wanna free stealthy US Navy ship? The US Navy is trying to give away some ships and is having trouble getting rid of them. According to an article in the Wall Street Journal: "One is called Sea Shadow. It's big, black and looks like a cross between a Stealth fighter and a Batmobile." Can we stop right there? They are having trouble giving away something that looks like a Stealth fighter and the Batmobile had offspring? Where are all the geeks? But wait: "The other is known as the Hughes (as in Howard Hughes) Mining Barge. It looks like a floating field house, with an arching roof and a door that is 76 feet wide and 72 feet high. Sea Shadow berths inside the barge, which keeps it safely hidden from spy satellites." Ah, the ugly step sister. That's why they can't offload it. Although some might be interested in trying to turn it into a museum, "the Historic Naval Ships Association warns, is 'a bloodthirsty, paperwork ridden, permit-infested, money-sucking hole...'" - whoa!